The focus of this study is on proper modeling of the dynamics for inter-system biases (ISBs) in multi-constellation Global Navigation Satellite System (GNSS) precise point positioning (PPP) processing. 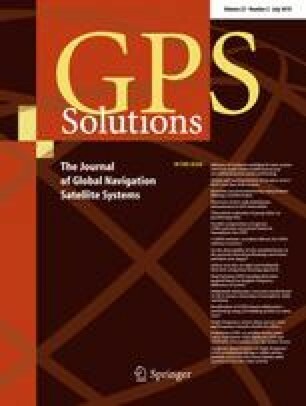 First, the theoretical derivation demonstrates that the ISBs originate from not only the receiver-dependent hardware delay differences among different GNSSs but also the receiver-independent time differences caused by the different clock datum constraints among different GNSS satellite clock products. Afterward, a comprehensive evaluation of the influence of ISB stochastic modeling on undifferenced and uncombined PPP performance is conducted, i.e., random constant, random walk process, and white noise process are considered. We use data based on a 1-month period (September 2017) Multi-GNSS Experiment (MGEX) precise orbit and clock products from four analysis centers (CODE, GFZ, CNES, and WHU) and 160 MGEX tracking stations. The results demonstrate that generally, the positioning performance of PPP in terms of convergence time and positioning accuracy with the final products from CODE, CNES, and WHU is comparable among the three ISB handling schemes. However, estimating ISBs as random walk process or white noise process outperforms that as the random constant when using the GFZ products. These results indicate that the traditional estimation of ISBs as the random constant may not always be reasonable in multi-GNSS PPP processing. To achieve more reliable positioning results, it is highly recommended to consider the ISBs as random walk process or white noise process in multi-GNSS PPP processing. We would like to thank the IGS Multi-GNSS Experiment (MGEX) for providing multi-GNSS ground tracking data, DCBs, precise orbit and clock products. The figures were generated using the public domain GMT software (Wessel et al. 2013). This work is sponsored by the Scientific Research Foundation of Shandong University of Science and Technology for Recruited Talents (No. 2017RCJJ074) and the National Natural Science Foundation of China (No. 41771475).